There was certainly no shortage of insanely powerful electric cars breaking the 1,000-hp barrier at this year’s Geneva Motor Show. Pininfarina lifted the wraps off the production Battista as Italy’s most powerful road car, while Rimac brought the C_Two prototype back to the show and Spanish coachbuilder Hispano Suiza made a comeback with the retro-inspired Carmen. And now Pagani wants to join the all-electric hypercar bandwagon. Speaking to Top Gear, company founder Horacio Pagani revealed that the automaker’s first fully electric hypercar will launch in the next decade. "Our future project is a fully electric car in 2024,” he told the publication. According to the report, Pagani is already two years deep into the EV project. 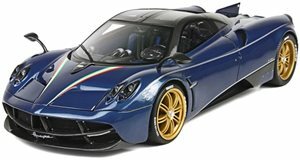 Battery development alone, which is likely to be based on existing lithium-ion technology, is expected to cost around €20 million ($22 million), so it’s an ambitious project for a low-volume manufacturer like Pagani. We wouldn’t be surprised if Pagani teams up with Rimac, which has established itself as one of the leaders in electric supercar development. Pagani added that reducing weight will be one of the biggest hurdles it will need to overcome. "The new Rimac C_Two is beautiful and impressive, but it’s just so heavy,” he said. "The Chiron is so amazing, but terribly heavy. Our Huayra is lighter, and can pull more lateral G. The real challenge is to make [the EV] a lightweight car. This is what Pagani customers want. A lightweight, beautiful to look at car with many details.” Another challenge will be the lack of noise, as an electric car can’t replicate the spine-tingling sound of Pagani’s AMG-sourced V12s. Pagani apparently has a solution, however. "We’re working on it, and we’re quite confident”, the company boss teased. Before Pagani’s electric supercar arrives, there will be an all-new supercar to replace the Huayra. According to Top Gear, it will go on sale in 2021 with an all-new twin-turbo V12 engine developed in partnership with AMG, despite V12-powered S-Classesbeing discontinued. "Mercedes is stopping standard V12 production, but tailored V12s for Pagani have nothing to do with that. They will continue,” Pagani told the publication.